Enter your email address / mobile number. New user Register | Forgot Password? Enter password of more than 6 characters. I agree to receive promotional SMS, Whatsapp, Emails. 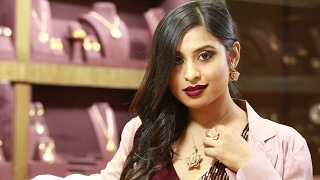 Blogger and Influencer, Ritcha decided to style her friends in Manubhai Jewellers Rose Gold Jewellery Collection - PINK. 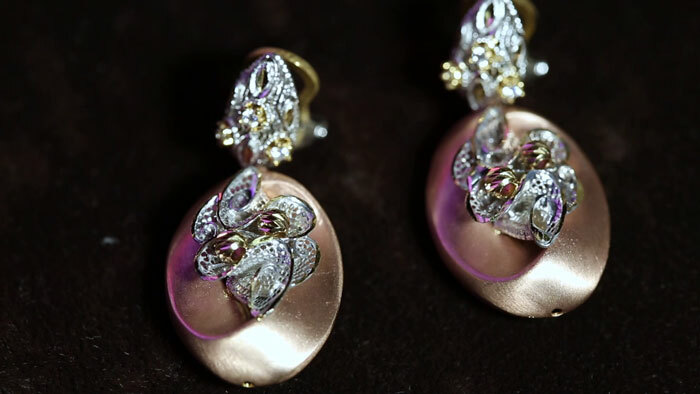 Rose Gold Jewellery is carving its niche in the hearts of Women today... Ritcha showcases how the pink metal can be adorned beautifully not just in diamonds but in various motifs without diamonds too. Wedding Jewellery Looks for Brides-to-be on Style Speak with Manubhai Jewellers! On your wedding day, you should look nothing less than a princess! Draped in the finest jewels crafted in 22k gold and studded with gemstones, Manubhai Jewellers presents wedding jewellery styles for the Indian Bride! Gold doesn't always need to be traditional! Presenting a new Gold Style Quotient on Manubhai Jewellers Style Speak! Wear these fancy collectibles to parties, brunches, concerts, your girls night outs and whenever you want to glow in that golden warmth! Want jewellery styling tips this Wedding Season? 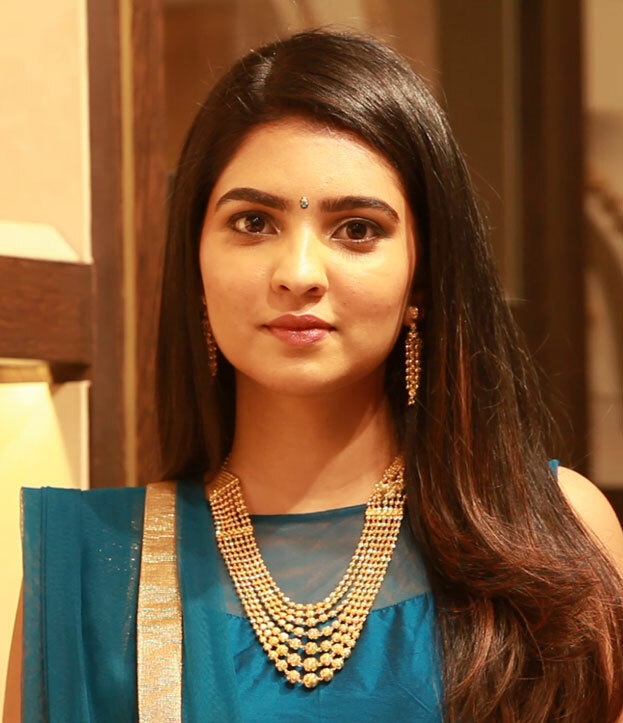 Madhura Bhogale pairs her wedding season outfits with jewellery only on Manubhai Jewellers Style Speak! 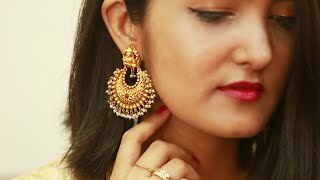 Madhura Bhogale brings you some fabulous style tricks on how to elegantly pair jewellery for the multitude of functions this wedding season! From Gold jewellery to enamelled Jadau jewels, catch it all on Style Speak with Manubhai Jewellers! Sarika with her mom Sonia Nagdeo explore the gracefully defined beauty of temple jewellery and how its different yet versatile. From adorning each other to sharing the love for heritage jewellery they talk it all with some interesting facts! Hesha Chimah gives you a glimpse into jewellery for any occasion. Hesha Chimah, shares styling tips on jewellery must-haves for different occasions. From casual first dates and those formal office attire, to the season’s festivities and the glamorous sangeet nights! 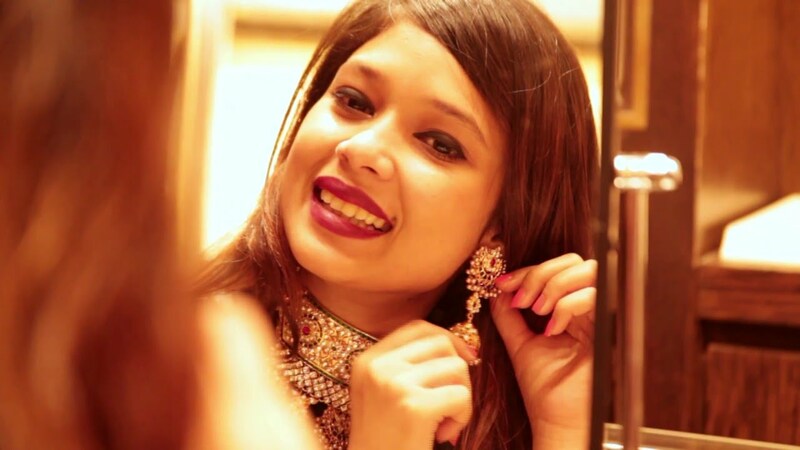 Sarika believes jewellery isn’t meant to be worn just once. This is why in this video she pairs a slick black dress with some ethnic antique gold jewellery. 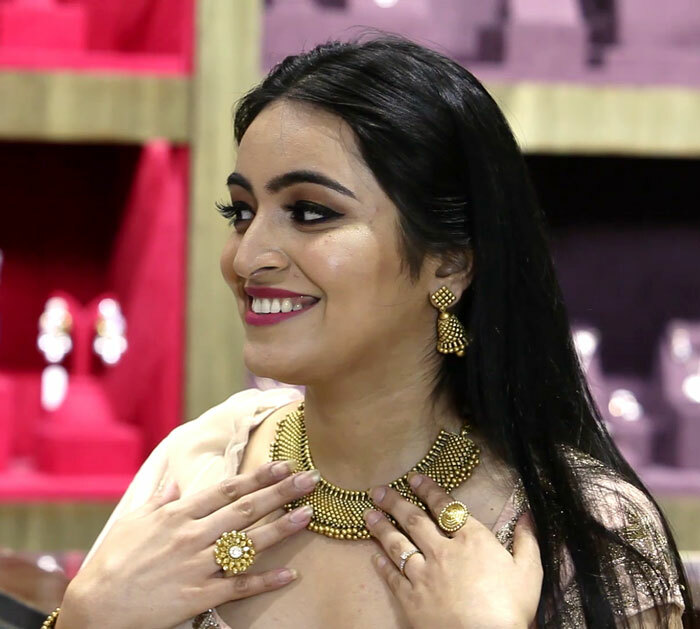 Bridal Jewellery can be tricky sometimes… So here’s Riya Jain sharing her selections from the Manubhai Jewellers Utsavi Collection. Here’s Shivani Patil from The. F.Drug; creating her very own look for brides-to-be. She picks the trendiest concepts and shares how mixing up sets can add in oomph to your wedding attire. Rose Gold Jewellery is the new rage! Dainty and fun pink gold adds a whole new look to your wardrobe. But if you’re confused on how to wear these beautiful bling’s, Ritcha shows you how on an all new episode of Style Speak. Here’s a quick sneak peek into each of these jewellery pieces that have featured. Ritcha chose to style two of her closest friends in the Rose Gold Collection and the giggles with the awe were unstoppable..
Ishanee is a young entrepreneur and runs her own coffee shop in Mumbai. She loves to bake and travel a lot! Married, she and her husband are usually hanging out on date nights and socialising with their merry troop of friends. 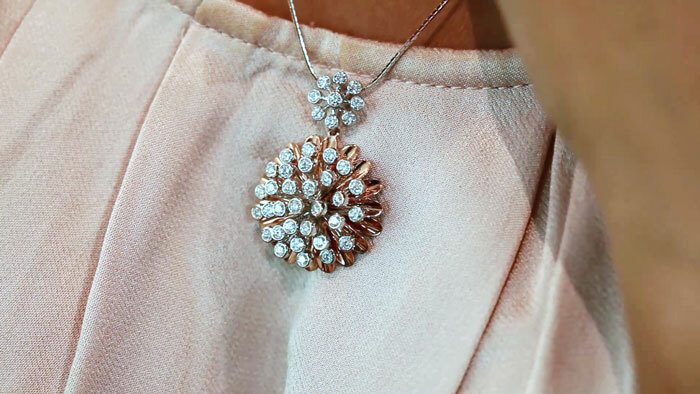 So for Ishanee, the first look Ritcha picked was a delicate yet out-there Pendant set in 18K rose gold and diamonds. The pendant set is inspired by wings and diamonds are set so beautifully that they look like feathers! Along with that she wore chunky rings in marquise diamonds and a matching kada. 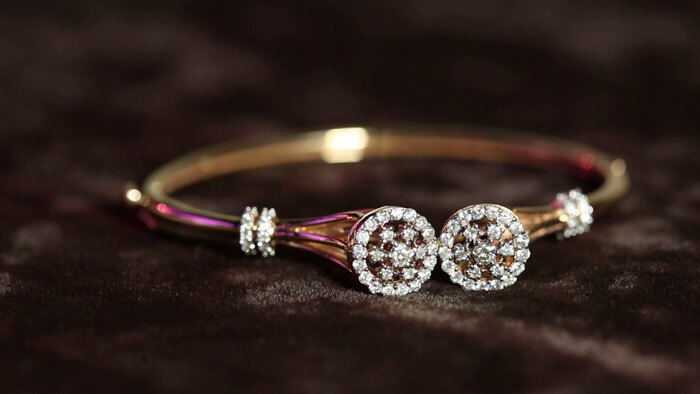 Crafted in 18K rose gold, the kada is encrusted with marquise diamonds in an elegant design of autumn leaves. Perfect for a quick brunch with friends, these jewellery pieces make the ideal match! Ishanee though travels to beautiful locations and loves catching up on date night dinners. 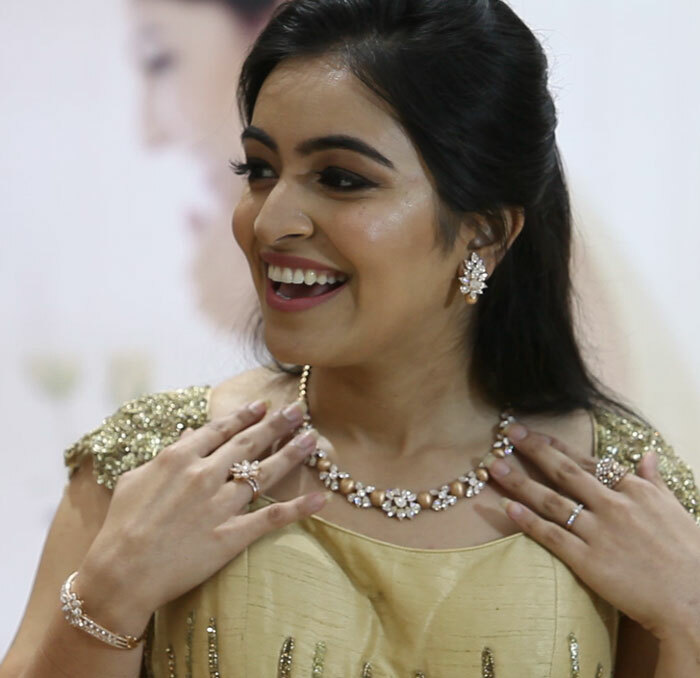 To keep it light yet classy, Ritcha has styled Ishanee in a gorgeous 18K rose gold multi layered necklace with a playful dash of twinkling diamonds. With cute studs, this necklace becomes the highlight of your evening. 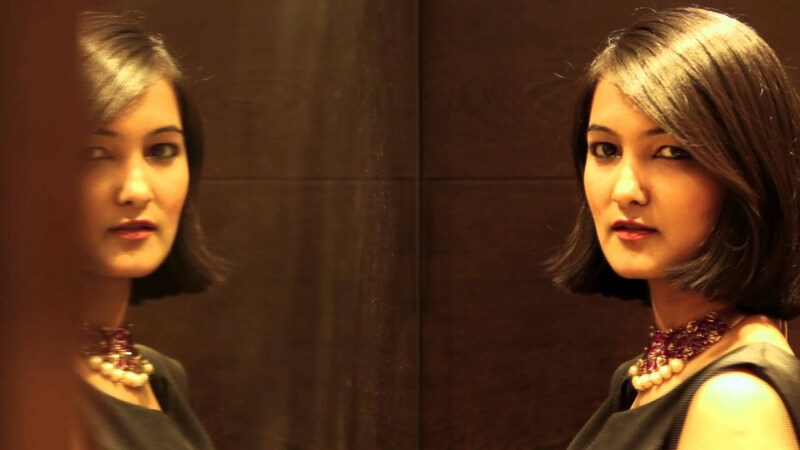 Dollie on the other hand is a beauty blogger and dishes out style tis on makeup, hair and skin care on her blog. While being a mother to 2 beautiful sons, Dollie is always on the go working on her blog. She too loves to travel and has a ball socialising with her huge group of friends. Being so actively social, Dollie needs to have her bling on point. So Ritcha has styled Dollie in a stunning dahlia inspired Pendant set. 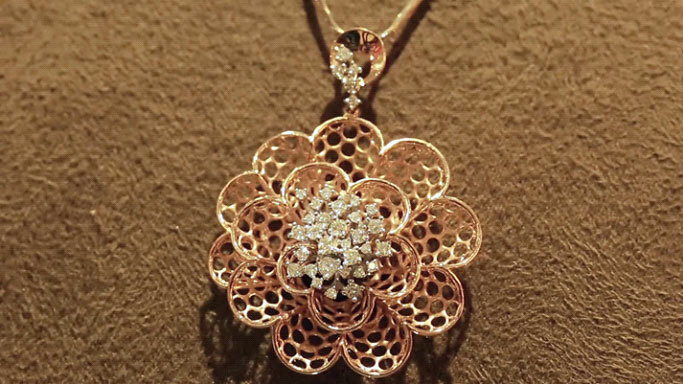 Crafted in 18K rose gold, the pendant set has diamonds set in levels to resemble a blooming flower. And the fun aspect is that each level spins creating a wondrous play of light. And Since Dollie is a huge fan of elite dinners and gets invited to glamorous evenings all the time, Ritcha has styled her in a delightful necklace set for the evening gown. Designed in a play of florals and art deco geometry, one can never go wrong with this set. Crafted in 18K rose gold and studded with beautiful baguette diamonds, this necklace and its earrings are the perfect cocktail wear. 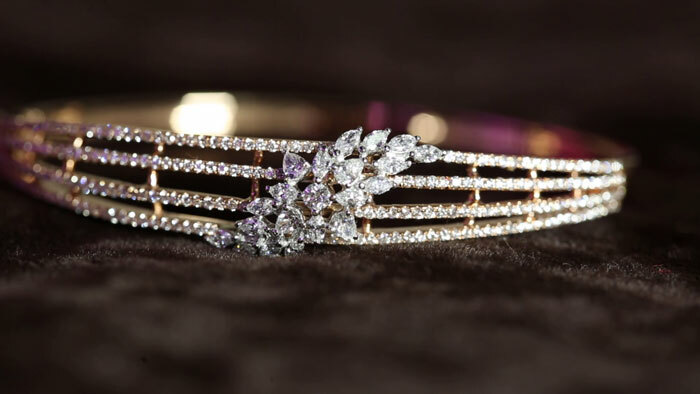 To match her set and also because Dollie is hugely fond of baguettes, she picked an exquisite quadruple design kada in 18K rose gold. Ritcha having styled both her friends in Diamonds and rose gold, wanted to go a different way. 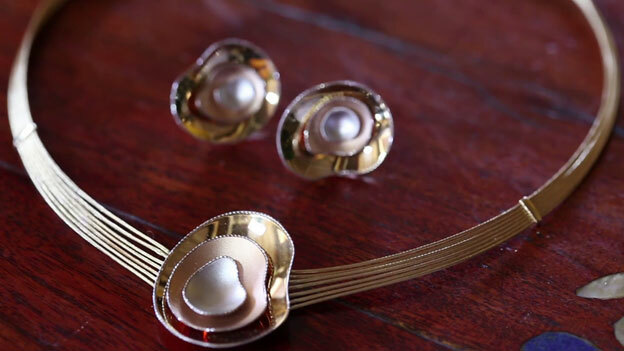 She picked some stunning pieces in gold without diamonds, but with a rose gold finish. To match her yellow summer dress, Ritcha has styled herself in a play of dual toned gold. Crafted in 18K gold and complete with a rose gold finish, the pendant set is inspired from the designs of Italy. 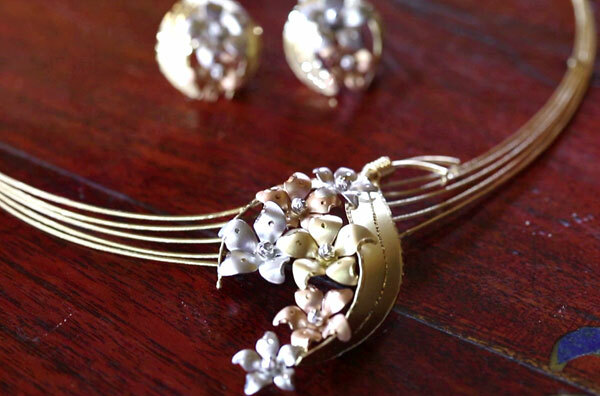 Minimalistic yet artistic is what Ritcha was gunning for with this pretty pendant set. 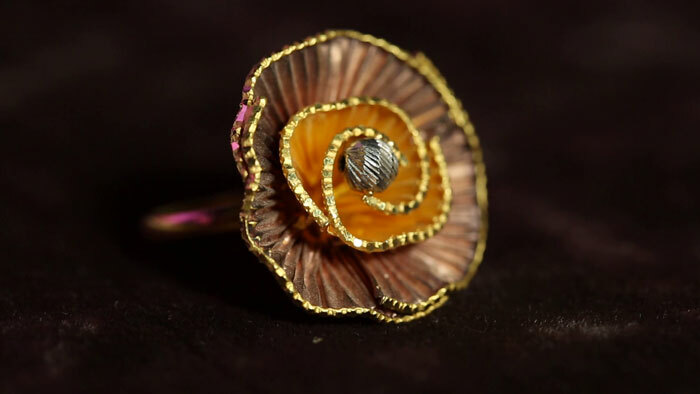 Ritcha teams up the set with an adorable floral ring create in 22K gold which again has a fabulous play of yellow and pink gold finish in a matt tone. Styling your wedding jewellery look could be tedious, especially when you’re managing everything else absolutely by yourself. We are decoding jewellery styles that all you brides-to-be can wear for all your wedding ceremonies! 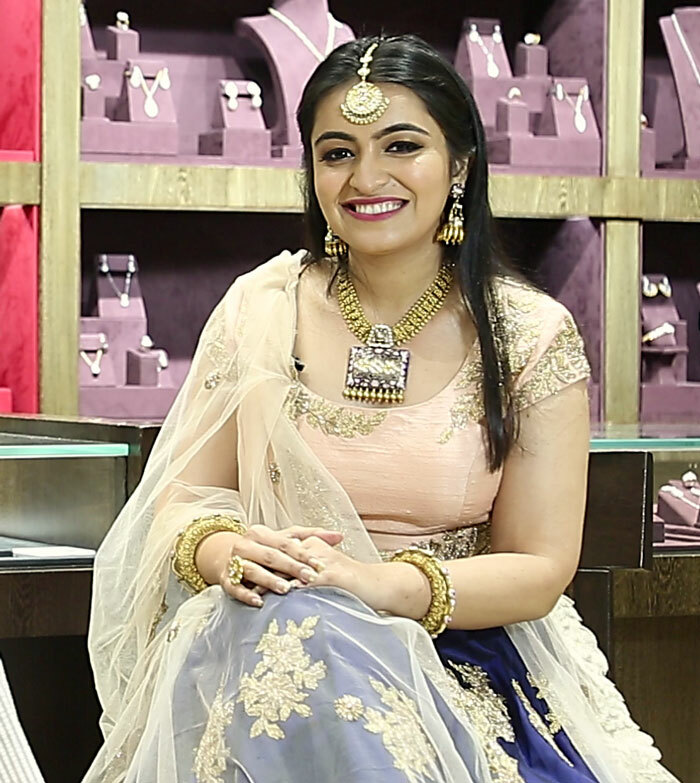 On this episode of Style Speak, Hesha styles bride-to-be Radhika for her Sangeet, Cocktail and Wedding ceremony. Here’s a quick sneak peek into each of these jewellery pieces that have featured. The fun, the families and dancing the night away makes for fantastic Cocktail functions. And you’re going to dazzle at it with diamonds! 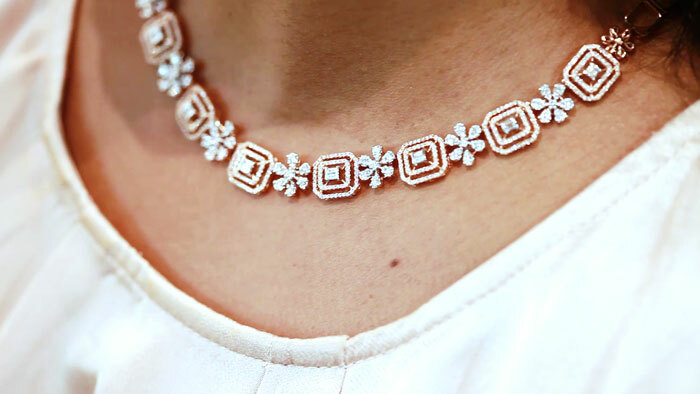 Perfect 18K rose gold necklace in pear and floral motifs with diamonds add glamour to your evening! Stud it up with matching earrings for just the right amount of dazzle. Complete the look with a dainty rose gold floral kada and matching cocktail rings. 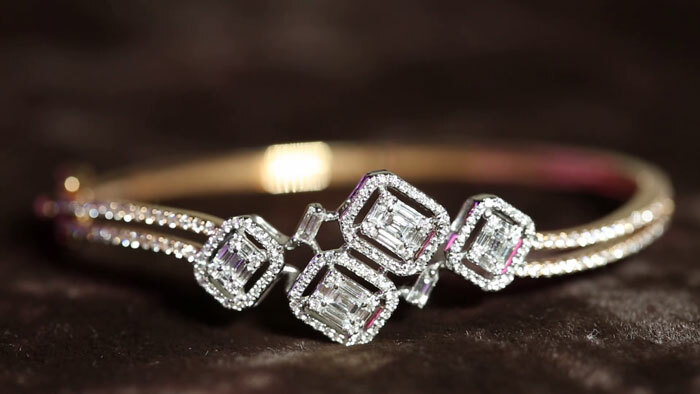 Difficult to go wrong with diamonds! And for Brides that love their gold more than their diamonds, Manubhai Jewellers has unique floral motifs in Italian designs. And we craft these gorgeous Italian designs in 22K gold too ! Featured here is a stunning 22K gold necklace and earrings in a melange of rose gold, white gold and yellow gold all in matt finish. Studded with American diamonds and delicate rhodium finish, this jewel is an ideal play of dazzle and subtlety. With the Sangeet, your wedding ceremonies begin to take off! So we thought let’s add to the colour of your function, with meenakari. 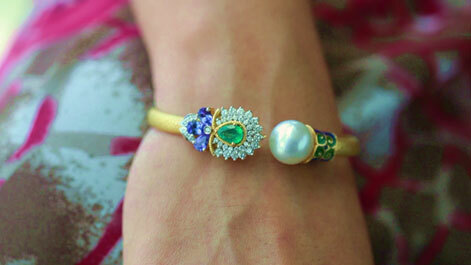 Beautiful Blue and Pink Meenakari comes alive in this elegant 22K gold masterpiece. The right blend of modern motifs and traditional artistry is what will make you the highlight of the evening. And adding to this alluring ensemble is the gorgeous 22K gold maangtika studded white parabs and complete with gold beads. But some Brides prefer the minimalistic approach and at Manubhai Jewellers, we got it all! If you’re lehenga is going to be full of colours, your jewellery can do without and yet look spectacular. Non-studded, Matt and understated, this classic 22K gold neckpiece comes together to make a modest Sangeet jewellery option. Despite possessing a traditional ethnic feel, the geometry in the design makes for a contemporary piece of art as jewellery! Complete the look with refined yet remarkably designed gold rings and you’re ready to enjoy your Sangeet. Today brides-to-be have a plethora of choices for their bridal jewellery sets and at Manubhai Jewellers you would find an assortment for every type of bride. And since our heavier necklaces feature almost everywhere; we’re presenting two bridal jewellery options for brides who want to look like princesses but want to also keep it delicate. Featured here is a magnificent necklace in 22k gold. Paisley motifs with white parabs, rubies and pearls in jadau karigari bring out the royalty of the necklace. 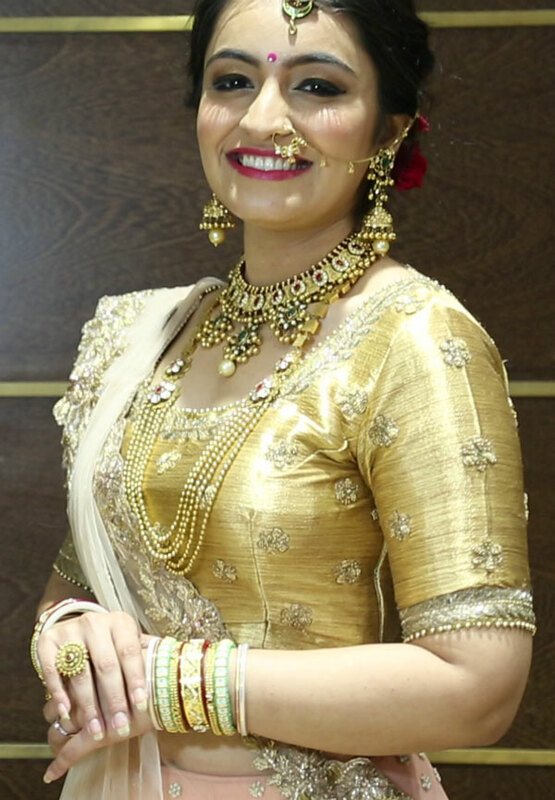 Adding to the traditional touch of the bridal ceremony, the look is complete with a 22K gold and kundan nath as well as a traditional pear drop gold maangtika. For this look, we’ve given the bride to be a dainty haathphool in gold and matching bangles in the other hand. Another bridal look trending today is layering up! Layering jadau jewellery truly creates an aura of royalty. So pairing your jewellery right becomes crucial! Instead of the usual choker, bride-to-be here wears a lighter necklace that comfortably hugs her neckline. Crafted in 22k gold and studded with semi -precious rubies and emerald, the set has three droplets with gold beads. The gold belt of the necklace itself has intricate nakshi karigari that adds grace and ethnicity to the set. Layer it up with a regal 22K gold beaded kantha to add in some splendour. The kantha starts with gold textured square shaped designs, that give off a matt finish and blends into gemstones florals. Since we are going all out traditional for the bride, we’ve also added in the quint-essential chuda in hues of gold, red and greens. Stay tuned for more jewellery styling tips and more jewellery designs to come your way! When you think Gold, do you think traditional too? 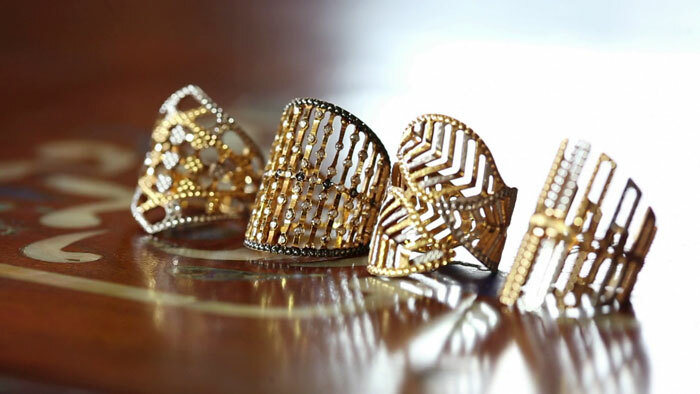 Well don’t… On this episode of Style Speak, Riya Jain from caught in a cuff shares; how gold jewellery can be worn in multiple ways for all your fancy evenings and occasions. 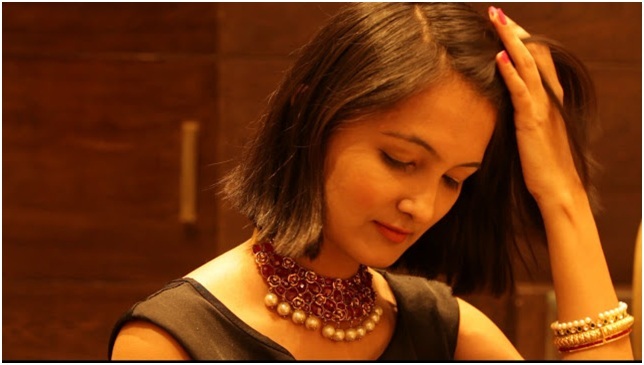 Here’s a quick sneak peek into each of these jewellery pieces that Riya has featured. Brunches and casual evenings call for glam, but in more subtle notes. To perfectly match your afternoon fun, you can pick from these gorgeous 18K gold neckpieces. Light in weight each neckpiece is a statement by itself. It uses the true metallic look of gold to its advantage. A mix of pink, steely grey, and glowing gold, the whole set adds in a dazzling look. These pieces are bold, shiny and modern! The sets are designed to feature a play of metallic and matt finish in gold, which is what drives attention to these jewellery pieces. One couldn’t possibly always wear a neckpiece.. And that’s why we created these feather weight chunky cuffs. 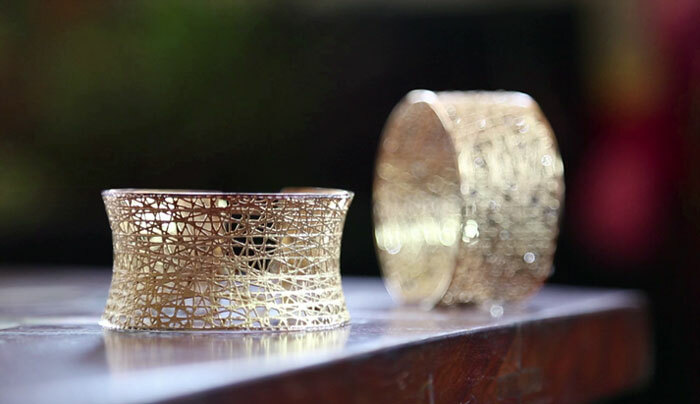 Lightweight gold cuffs are a trend today. Whether it’s a chunky cuff or multiple bangles in one, these bangles are the rage. Lattice, lace patterns, meshes, leaves based motifs and add to that the element of pink gold and you have a party piece right here! Cuffs teamed with rings, is the new minimalist look. Now make bold, gold statements with 22K gold rings. With a mix of rhodium finish and cutwork, these rings are complete dazzlers. Adding in a chunky neckpiece is another way to stand out from the regular. Who said you can’t go funky with gold! A dash of colour and an eclectic mix of 2 -3 jewellery essentials like keshi pearls, south sea pearls and amethyst beads; and you’re good to go for your best friends party! “After women, flowers are the most lovely thing God has given the world”, said Christian Dior. And today, we’ve curated a few floral looks for all you lovely women out there on Style Speak with Swati Sharma from The Archattire. 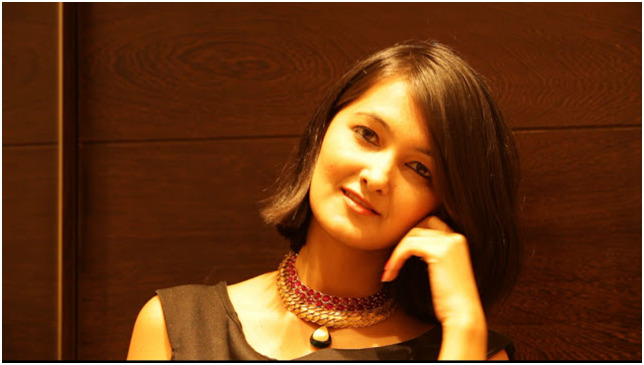 Here’s a quick sneak peek into each of these jewellery pieces that Swati has featured. Summers mean wider necklines and weightless fabrics. 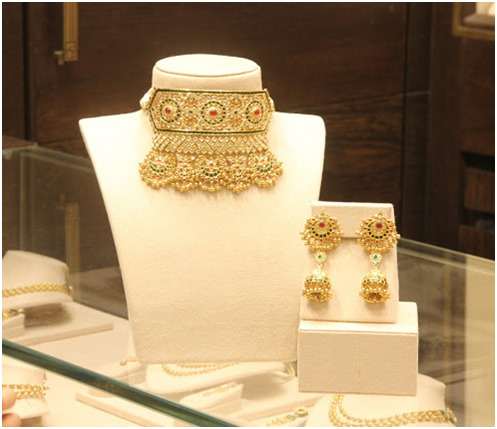 To style up your outfit, you can pick from these beautiful 22K and 18K gold pendant sets. Swati is wearing a dual toned pendant set with shades of 22 K rose and yellow gold and hints of white gold. This pendant set also has its own matching ring to complete your ensemble. A beautiful combination of floral motifs in full bloom is the perfect accompaniment this season. We don’t stick to only roses, and neither should you! We bring you this 22K gold necklace with matching earrings and American diamonds. Adding depth to this matt finished gold necklace are these finer circular designs on each petal in white gold rhodium polish. 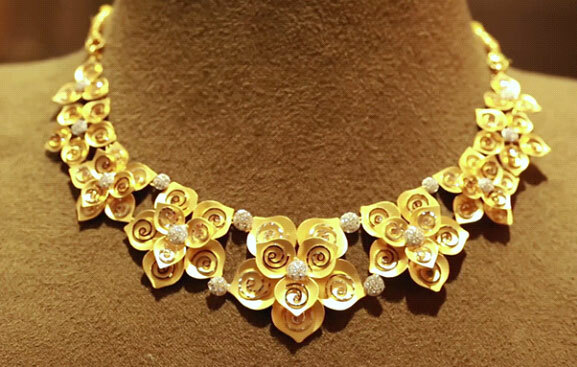 And if you aren’t the full gold girl, then we have another option for you with this delicate floral necklace. With multi-coloured hues of 22K gold, you can pair this with absolutely any colour. Whether its wedding ceremonies or receptions, it gets truly difficult to find modern looking chokers to match an outfit. 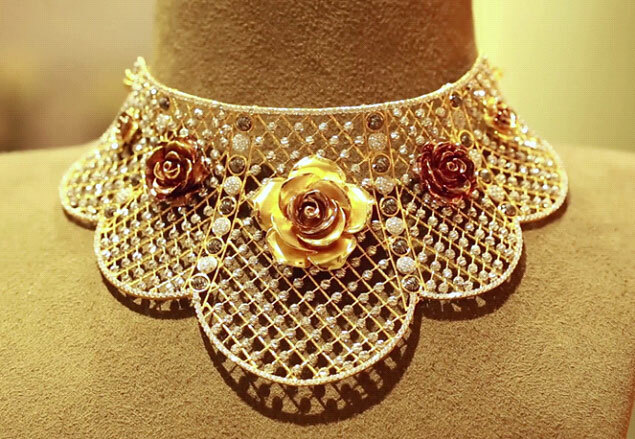 So we reworked the timeless rose motifs to craft this grand 22K gold choker. If you’re a bride this rose- studded beauty will seamlessly complement your lehenga. Even if you’re not getting married, worry not, you could pair this with an indo- western gown for your sister or best friends cocktail ceremony. 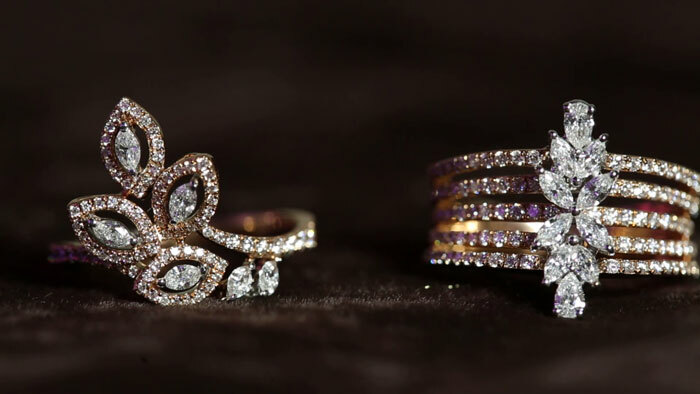 Flower Power has always reigned in diamonds, and on Style Speak we have some diamond treats too. Crafted in 18K rose gold, each motif is symbolic to the summer spring season. With brilliant round diamonds through the neckpiece, we added a little pearl drop for some more charisma. 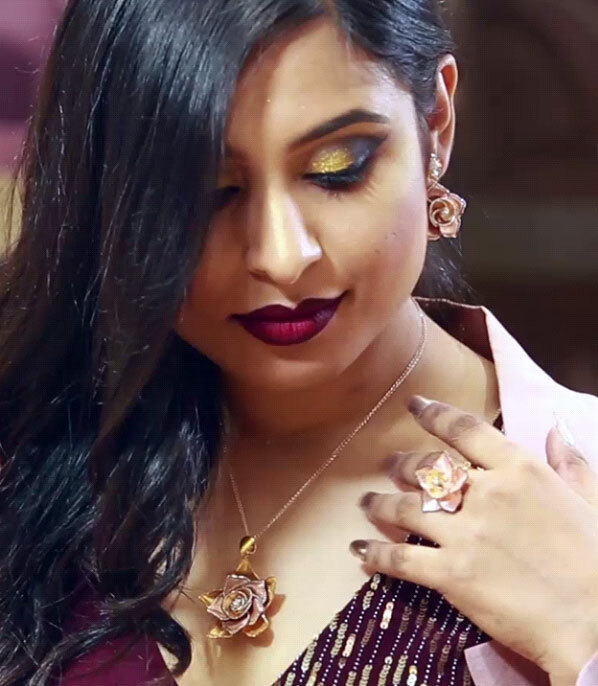 Madhura Bhogale from BeMadly.in has shared some fabulous style tricks on how to elegantly pair jewellery for all those functions this wedding season... Here’s a quick sneak peek into each of these jewellery pieces that Madhura has featured. Not every sangeet or mehendi function needs you to have diamonds! Here we have a 22K yellow gold multi-layered necklace for those fun evening of dance and music. 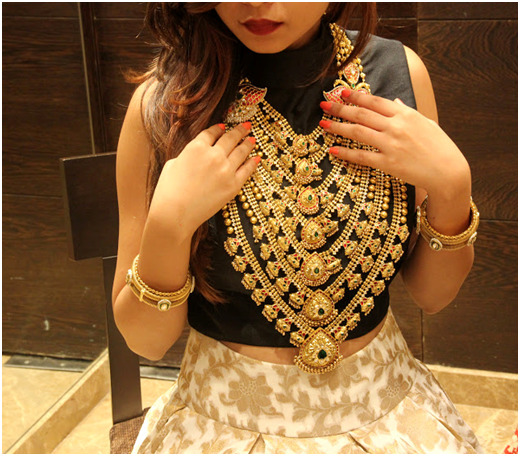 Each gold bead through the chain have fine cutwork work all over it; adding that golden glow to your evening. And it’s true; those beautiful gold danglers will definitely help you shimmer through the night. Cocktail Parties at Indian weddings are all about the GLAM! Today cocktail parties are about making style statements, where you get a chance to wear that indo western gown or saree. So let your jewellery do the glam talk, with these 18K chandbalis that sway so gracefully. These beauties are encrusted with brilliant round diamonds and champagne diamonds to add in that colour. And with a matching cocktail ring in marquise diamonds, you’re all set to style up the night! There is no denying that Jadau is the flavour of the season! The traditional karigari and multitude of colours, give you a chance to go all ethnic beauty this wedding season. 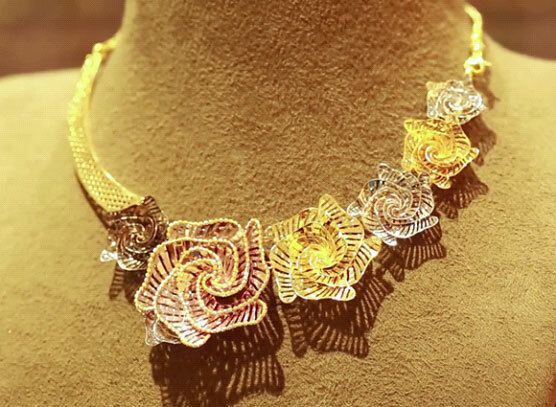 This 22K Gold multi layered necklace combines more than one element; and that’s what makes it so special. Each amulet in this 3 lined neckpiece is carved with stunning white parabs in takkar kundan work. The first layer of red and green stones simply complements the next 2 layers of blue enamelled jewels. And with south sea pearls you just added in the classic look to the entire ensemble. 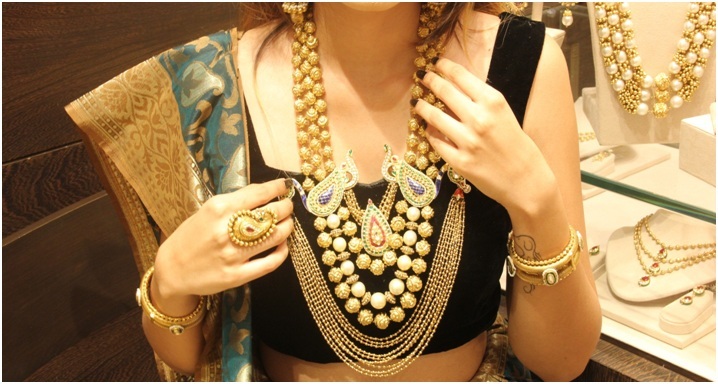 SarikaNagdeofrom The Style Compile has taken us over an ornate walk through design and the history of temple jewellery. Here’s a quick sneak peek into each of these jewellery pieces that Sarikahas featured. 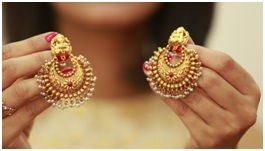 These 22K chandbaali's have a delicate matte gold finish which looks subtle and has fine detailing. If you look closely here, you can see the various elements of filigree, bead work and carving that elegantly blend together. These little keshi pearls here add a faint grace to these chanbalis. Temple jewellery is the perfect blend of heritage, art and fashion. A simple style statement; this pendant truly looks as if a painter from another era decided to capture all the essence of Lord Krishna and his life in 22K gold. Look closely and you will see the chitrayikarigari done so meticulously; outlining every detail in such glory. A little known fact about temple jewellery is that every element of temple jewellery is handcrafted. 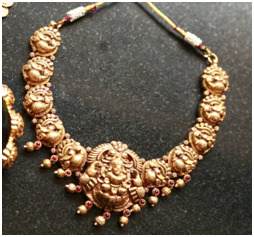 Temple jewellery uses absolutely no mould to create these artistic Gods and Godesses images on the neckpiece. Each and every piece is physically moulded by the karigar and depends largely on the creativity and skill of karigars. Just like this beautiful 22K gold necklace with antique finish and rubies. 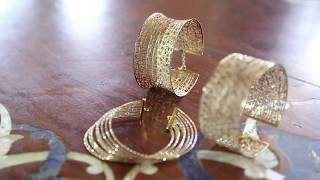 These elegant 22K gold bangles have karigari that combines Goddess Lakshmi to form this stunning piece of art. 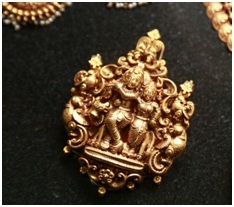 The use of various deities to create a heritage look is the true beauty of temple jewellery. Most common designs are those of Goddess Laxmi, Radha-Krishna, Lord Ganesha and Lord Karthikeya. And surprisingly though chunky and large, these pieces are really light in weight. Temple jewellery too has another school of thought from the karigars of Jaipur; which manifests into these 22K gold neckpieces. 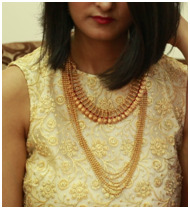 Sarika has adorned a beautiful temple choker that marries dye work with beaten metal. The hammered gold with Goddess Lakshmi on individual pendant pieces adds in a folkloric look to the whole set. Whereas the little red rubies give it a royal feel. And what a fabulous way to match the set with these traditional modiyas; typical Rajasthani bangleswith rubies. So today’s post is something really different and I haven’t done anything like this before. Maybe that’s why I am beyond excited to share my lovely experience with you! We girls don’t get to wear a lot of jewellery unless we’re getting dressed up for weddings or family functions, and even if we do, it’s very subtle and minimal. 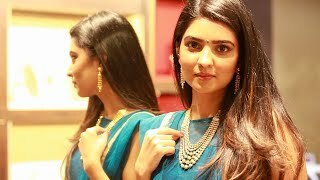 I was very lucky to pair up with Manubhai Jeweller’s for their Utsavi collection a few weeks ago ! They have the most gorgeous jewellery pieces ever! 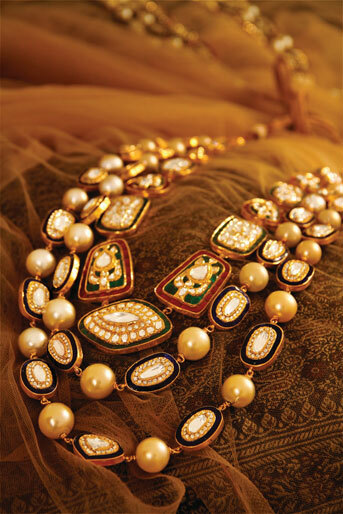 The pearls on the necklace are called Keshi Pearls and the jewellery has beautiful Nakshi work on them. The second I saw the necklaces, their sparkling colours caught my eyes.They went perfectly with the saree I wore, and I wish I could buy them so they’d stay with me forever! The colours and the sparkling pearls are what seized my attentionThis one below is called the Peacock necklace. It has so much of detailing that makes it authentic. There are loads of bright colours so you can wear them with any Indian outfit and they’ll still look beautiful. The different colours play the ultimate role of a statement piece for your outfit so you can keep your outfit simple and elegant at the same time! But my personal favourite is the choker necklace! I think it is absolutely gorgeous! And as I said, we don’t get to wear too much jewellery so this was a one of a kind experience for me. I love experimenting with different styles but this was really unlike anything I’ve done and I had so much fun! So that’s all for today. Tell me what you think in the comments! It's been long since I've posted here but I'm more than making it up on Instagram :') But I'm doing all kinds of making up with this bomb post which I recently shot at Manubhai Jewellers(Borivali). Manubhai deals with real gold and diamonds which lets me don their wedding collection called "Utsavi". I can describe their collection in one word, that is gorgeous. All of the pieces are so different and equally beautiful. I choose to go for a heavy look first and balanced it with a relatively lighter look. Let's talk about the first look where I chose a choker with ghungroos. Even though the earrings made the look a little OTT but the royal look simply asked for it. For the second look, I went with a heavy layered neck piece and bangles with Keshi pearls which I absolutely loved at sight. Yes, it is quite the Jodha Akbar type and carrying it off totally gave me the chills. But I dig such jewellery for personal weddings. They speak statement, have been traditionally won't over the years and one can hardly go wrong with it. The designs were breath taking and I was lucky to wear what I personally loved. Do visit them to have a look at some unique pieces that are a must for Indian Weddings. For someone like me, who has just entered her twenties, the word “marriage” does come to mind often. Sooner or later, just like any other girl, I will be planning my wedding and wishing that it would be exclusive and an exciting experience. Although, one would not expect me to be the conventional shy bride, but, my outfit and jewelry shall definitely play an important and major part in my wedding preps. But, one question comes to mind! What will I do with my heavy bridal jewelry after the wedding? I’ve witnessed my mother and relatives who store their wedding jewelry as family heirlooms and pass it onto their future generations. But, what is the point of buying precious jewelry when you can only wear it on your wedding? 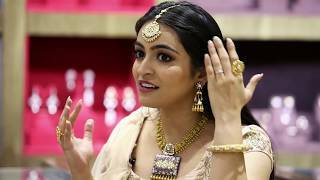 Recently, my cousin got engaged and is set to get married in December and hence, I visited Manubhai Jewellers in Borivali to get my hands on something special for myself and my family! I walked in wearing a LBD and got the ‘confused stares.’ Well, if my jewelry can look good on a casual dress, it is bound to look amazing on ethnic wear. Plus, I was really looking for something that could be worn on casual evening wear and festivities. I somehow made my mind that finding such jewelry would be a tough task, but turns out that it wasn’t so. When they asked me what I was exactly looking for, I gave them my exact specifications – The Occasion, Should not be too flashy, should be a rare piece and should be wearable on all sorts of occasions. The staff at Manubhai Jewellers knows their job very well. They provided me with an array of options to choose from. 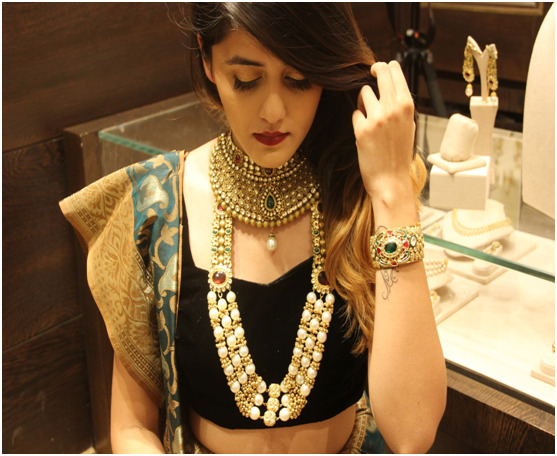 I had my eyes on their Modern Fusion Collection which consists of matte gold kundan and jadau jewellery adorned with south sea pearls and other precious stones. I thought to myself “Was I in heaven? Is this even possible that these jewels have met my checklist?” Also, my second favorite collection was their Utsavi Collection which is for the “dream bride.” One look at it and your wedding guests are bound to look at you again! 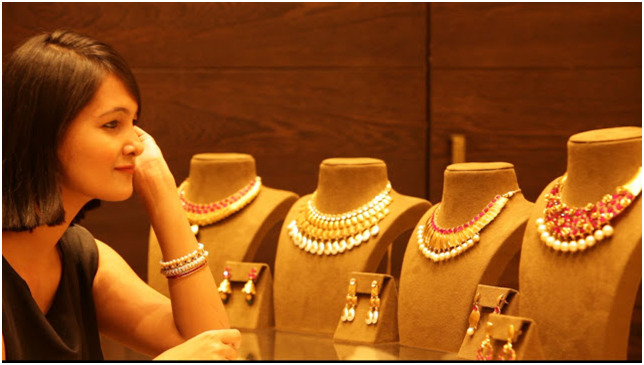 For those who do not know of Manubhai Jewellers, they are located at Borivali West and are one of the leading retailers for gold, jadau and kundan and diamond jewellery in Mumbai. 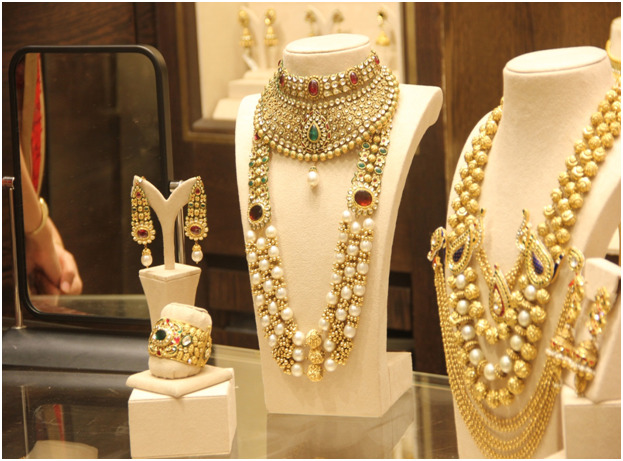 P.S – From a traditional bride to a modern bride, their jewellery meets every bride and her family’s needs. Make sure you drop by once! Hesha Chimah from The Style Company has shared some fabulous style tricks on how to adorn each occasion with simple yet elegant jewellery.. Here’s a quick sneak peek into each of these jewellery pieces that Hesha has featured. Diamonds have an everlasting charm and once you pair them with coloured stones, it makes that piece even more gorgeous to wear! Here we have an 18K yellow gold kada, with VVS certified diamonds with a delicate combination of amethyst and semi-precious emeralds. The gold metal has a fine textured feel over the entire kada; with the design being complete with a south sea pearl and subtle enamelling to complement the coloured stones. Here we have a finger cuff, royal and majestic as it gets. 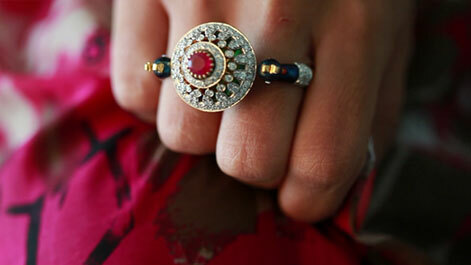 With enamelled gold peacocks that enthrone the diamond encrusted and cabochon ruby, crown at its centre. Jadau at its regal best! 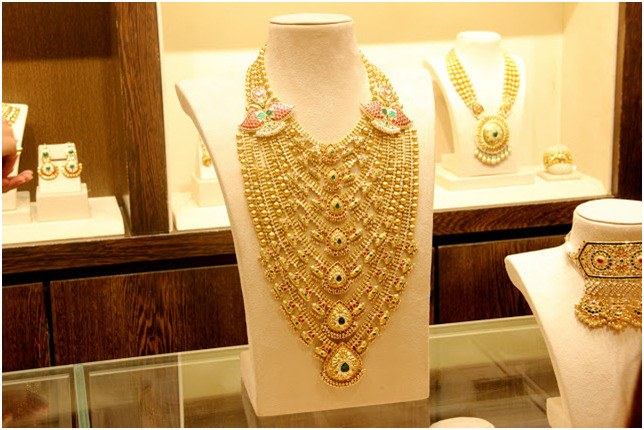 This 22K Gold neckpiece combines more than one element; thus making it to our special treasure trove. Beginning with various crafted elements of flowers, gold beads and gold leaves, this glorious piece drives all attention to its carved jade paisley in the centre. The luscious little red gems add in the colours; which is completed with half rings of the symbolic ‘tikka’ adding an ethnic grace to the whole jewellery piece. Complementing the neckpiece, are the delicate carved jades and south sea pearls as tiny jhumkas! 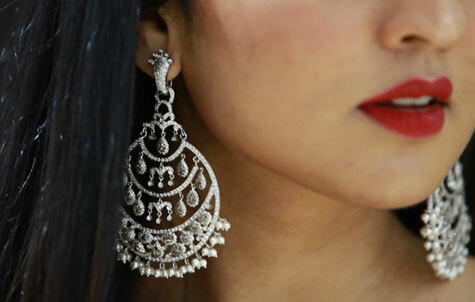 What is style without the quint essential pair of jhumkas! These 22K gold crafted baubles are the whole package of a summer delight! A sunflower inspired stud with gold beads and semi-precious stones in takkar kundan work; the jhumkas give you the traditional yet trendy look of the season. Bound with keshi pearls through the jhumkas, the delicate latkans add in the fun of the look. Here Hesha picks the classic Maangtikka for her look… Isn’t it fabulous when you get to wear a gold flower in your hair! Crafted in 22K gold with intricate carving on the edge of this floral headgear, a maangtikka accentuates the eyes and forehead so elegantly. The white parabs have been set carefully to highlight the colour of rubies which are in an invisible setting, with just a mild hint of green enamel.